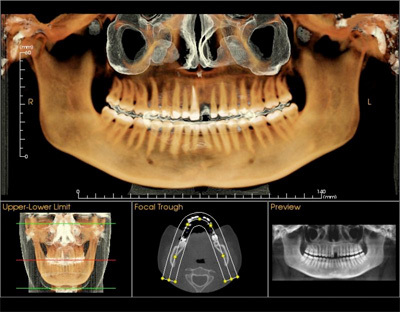 3D ConeBeam Imaging is a simple, fast scan that utilizes new technology to create virtually limitless views of the face, neck and teeth, for more complete treatment planning. From the scan, the doctor can see computer-generated views of the bones, teeth and other details, frm any angle, in 3D. Typical dental x-rays focus only on the teeth and for each x-ray picture, you need one exposure. 3D ConeBeam imaging provides more complete visual information that allows each case to be studied from every angle. Scan data can be duplicated easily, allowing scans to be shared between specialists.